One Pan Tuscan Pork Chops are a delicious, easy dish your whole family will love- and won’t cost you your diet goals. 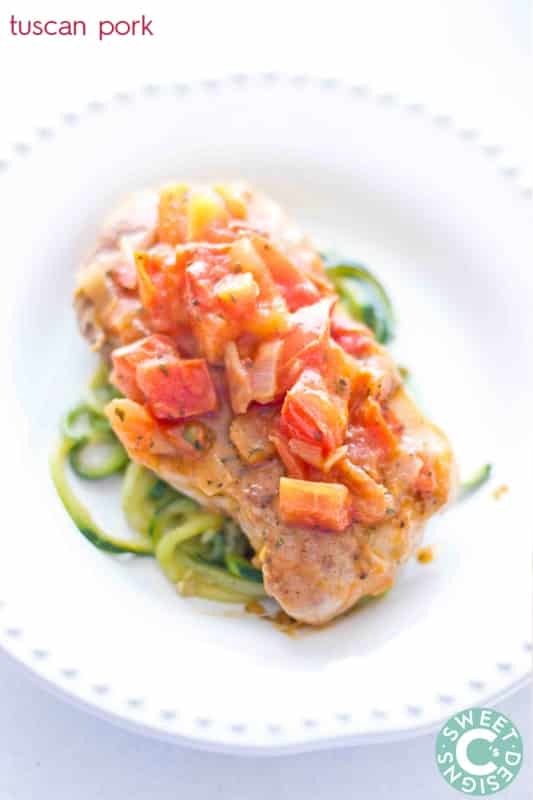 These are delicious plated with zucchini noodles as pictured, but if you’re not following a paleo diet, it is very tasty served on a bed of pasta- or even quinoa. If you’re following a paleo diet, (or just trying to eat fresh unprocessed foods more often, as we are) you know how time consuming creating meals can be. Fresh food is very obviously better for us- but let’s face it- it can be a pain to make meals centered on whole foods night after night, no matter how much you want to. Since I’ve been battling a host of health issues, I have very little energy many nights. Chasing after the kids all day, trying to run the blog and keep our house some semblance of clean is not the easiest when you feel awful. I often fall back on ordering food those nights, but I know they often just make me feel worse. So I’m trying to find more meals that are simple, easy, and not extremely expensive to make. This tuscan pork is incredibly simple and quick to make, and is delicious! Our insanely picky son even ate some… anytime I get to cut down on preparing additional meals is a plus in my book. Heat a large, heavy pan on high until warm. Add oil and heat until shimmery (but NOT burning/smoking) about 20 seconds. Brown pork chops on each side, about 1 minute each. Reduce heat to medium-low, add onions. Stir onions and flip pork chops after 2 minutes on each side. Add tomatoes, garlic and spices. Simmer until tomatoes are soft and sauce has set up- about 5-8 minutes. 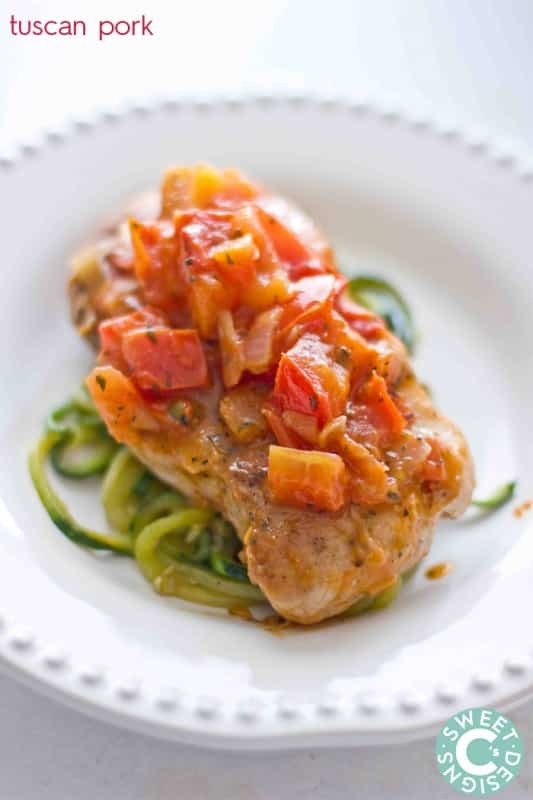 Serve on a bed of pasta or zucchini noodles. How do you think this would be with chicken breast? Trying to use what I already have on hand…..
You changed your recipe!? I swear it was fresh tomatoes when I made it in the past , it was a big part of what I loved so much about it. Do you have the original you could send me? Kylee – when I updated recipe plugins, I had some mis-haps with a few and was going off old notes. For fresh tomatoes, use 1 cup cherry tomatoes, and let them cook long enough to burst! Sorry about that. This helped clear up confusion for me as well! I thought I had the wrong recipe! This is so delicious. Thank you! Great tasty recipe. I had some porkmedallions and was out of ideas. This is easy , tasty and will try it again. The punctuation was suppose to be !! Not ?? This was delicious!! We served it over spaghetti squash and along side a salad! Definitely a keeper ?? LOVE spaghetti squash! I make it like baked spaghetti-my son and husband eat it up. I have made it with riced veggies instead of meat also-gave the same texture. When we eat this I feel like we’re making up for all the veggies we should be eating the rest of the time. This tasted so good. I was so amazed how the onions and garlic didn’t take over the dish (since I used thin pre-cut pork chops, I only used 1/4 onion, still fabulous). However, I made this today, 11/17/15, therefore the tomatoes didn’t have much juice so I didn’t get much sauce. I was wondering if you had any suggestions to combat this situation? Sometimes you cook off more juice than you plan to- you can either add a little more tomatoes, some cream, a little water or butter- or try adding the tomatoes just at the end! Going to give this a try serving it over spaghetti squash. Thanks for the recipe!! Thank you for this recipe!! I honestly can’t believe how delicious it is considering how little time and effort it took! Really could not be better. Definitely one of my new favorite recipes, SO happy with it!! Thanks!! Did you use dried or fresh herbs? Should I use different measurements if using dried herbs? I like to use fresh whenever I can- they just taste better. It depends on which herb you’re using, honestly. I’d season with a little bit at a time until you find an amount you love. With dried herbs, I always start at 1/2 tsp and add 1/2 teaspoons more until I get an amount I like! I just made these pork chops and they were great….i think my pork chops were too big but im going to try it again next week with smaller ones…. I’ve just tried your Tuscan Pork Chop recipe. It was really easy and healthy. I decided to serve it zucchini fries. Delicious! I’ve tried making this a few times with 6 or 8 chops and my onions/garlic tend to burn. I always use canned diced tomatoes, so there is excess liquid, but I’m not sure why they crisp up. Any suggestions (or general pointers) for expanding the recipe? I love making this early in the week so that I have leftovers! With 6 to 8 chops, I’d slowly cooke the garlic and onions until browned, and then remove them from the pan. Cook the chops to give them a good sear on the sides, and then add the tomatoes and onions/garlic back to the pan, uncovered, and cook until the liquid is absorbed. Since there are more chops when you’re doing it, it really slows down the cooktime, which would give the onions a chance to burn. Taking them out will let your pan get hotter when you put the chops in and let them get a good sear- and then you can add them back so they don’t burn. Making this tonight. Can’t wait! I know they aren’t fresh, but can you use a can of diced tomatoes with the liquid? I made the Tuscan Pork Chops for dinner last night. Always looking for pork recipes. Trying to cut back on red meats. This recipe was delicious. I will be making this again. Thanks for sharing.